Hello all! Welcome to a new segment of the site I call Take Two! You see unlike mainstream games, there’s no such thing a single English Visual Novel release. If a writer is so inclined they can go back and refine a previously released project to develop their skills with a happy audience more than willing to return. And who am I to miss an opportunity to prove myself right…or wrong as the case may be? So here’s how this is going to work. These will not be nearly as long or in-depth as the reviews and no scores will be changed. If I’ve reviewed it already it will stand. This will usually be a recommendation of support for writers and producers who show they’re willing to put in the time and effort to get better and not just release schlock and call it a day. So, what better place to start than with something I’ve review recently: S-Morishita’s A Troll’s Fairy Tale. You can read the original review here but this was a NaNoRenO title that suffered from most of the problems NaNoRenO titles do. It’s a decent love story that revealed in its fantasy world and managed to endear in many parts, so it’ll surprise absolutely no one to hear that nothing has changed story wise. Instead more administrative and artistic work was done to give it a stronger presentation. The grammar, which was the weakest point of the original launch, has been cleaned up and while there are some spots here and there that I know my old English teachers wouldn’t approve of, I personally don’t want to tear my hair out reading it now so that’s a vast improvement. Also the title is much more user friendly now with an updated interface that cleaned up most of the problems I had with the original system. It’s funny to think that simply going to the main menu from the game menu is a system improvement but I’ll take what I can get. Finally young Morishita has added several Event CGs to compliment the overall story and they all look great. While she certainly has a lot of room for improvement, Morishita is very talented and can put together some good stuff, as seen above. This is also the first time we get a clear look at our main character Acacia instead of the formless blob her avatar is. That avatar, sadly, is not changed but from the CGs you can see how she can appear like a typical barbaric troll if she wanted to and how she could appear like a big softy whenever no one is looking. 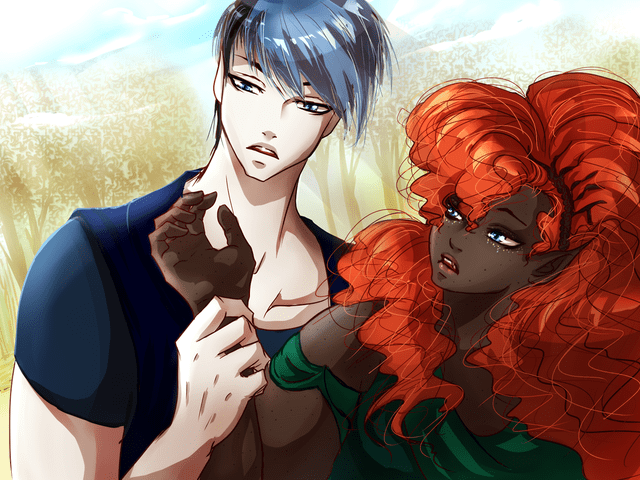 So, if you haven’t played A Troll’s Fairy Tale yet I think you should: especially if you’re into otome. The otome EVN blogs (yeah I know you guys exists) has been raving about this thing and it definitely shows S-Morishita’s potential in the medium. Here’s looking to even better for her in the days ahead. You can download A Troll’s Fairy Tale here!